Polarforscher (1874-1922). 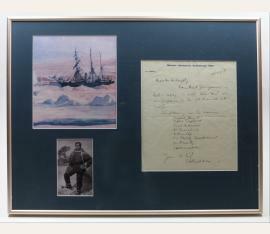 Autograph letter signed ("Ernest H. Shackleton"). [London. 2 SS. auf 1 Bl. 8vo. 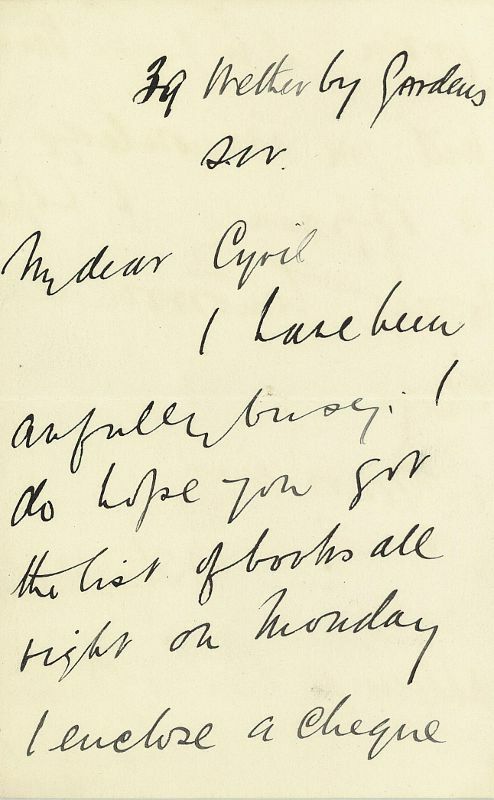 To Cyril Longhurst, secretary to the British National Antarctic Expedition: "I have been awfully busy. I do hope you got the list of books all right on Monday. I enclose a cheque from Sir Joseph Verdin Bart. Will you acknowledge it officially. I hope to see you tomorrow old chap." 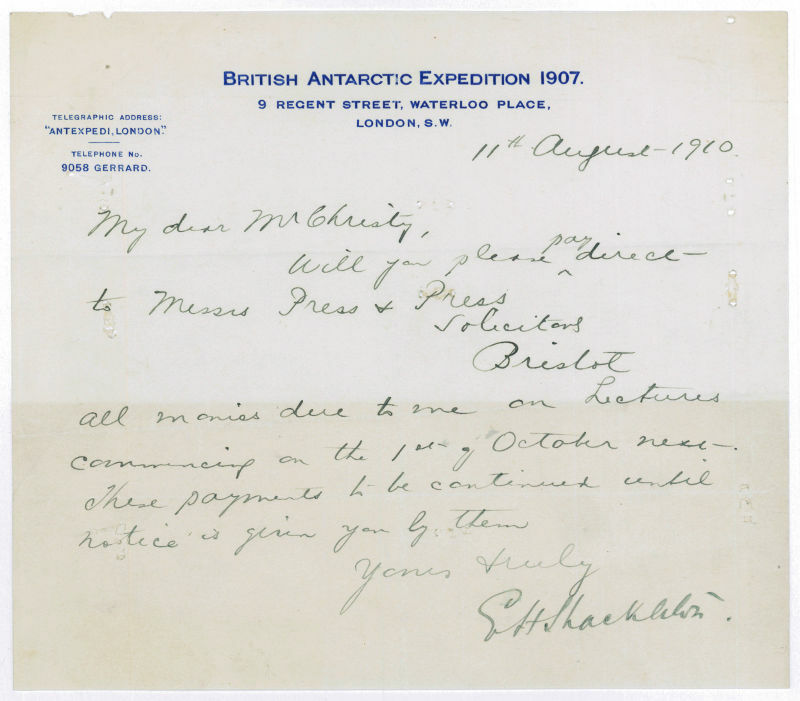 After his signature, Shackleton adds, "Address all letters 30 Gloucester S." - In 1901, Shackleton was chosen to participate in the Antarctic expedition, where he was responsible for seawater analysis, meals, and provisions. The stress of preparing for that voyage evident as the ”awfully busy” sailor ties up some loose ends before shoving off. Most likely, “the list of books” were requested to accompany the crew on the upcoming voyage, which departed London on 31 July 1901. 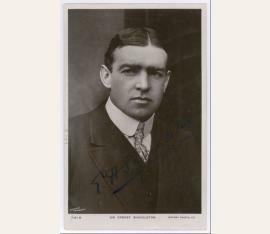 In 1904, Shackleton married, with his “old chap” Cyril tapped as best man. - In fine, clean condition..
Polar explorer (1874-1922). 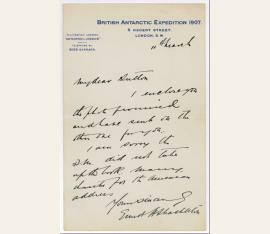 Autograph letter signed ("Ernest H. Shackleton"). London. 8vo. 1 p. on bifolium. 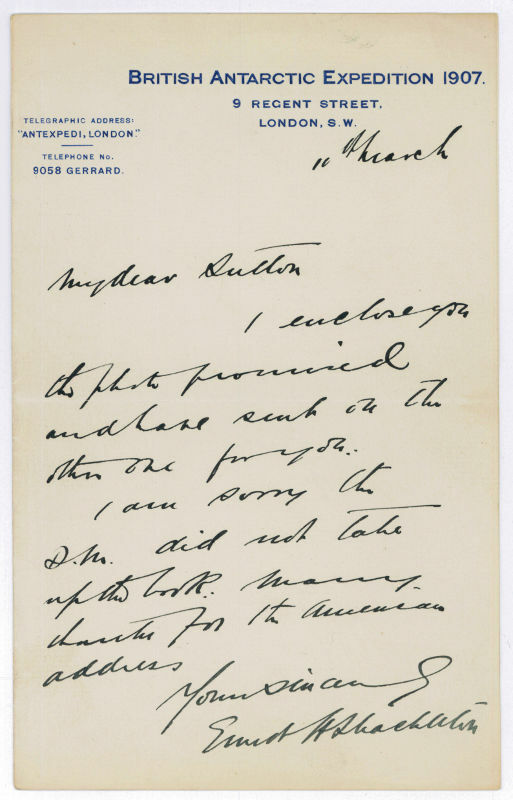 To "My dear Sutton", referring to a photograph, a book which has not been "taken up", and some American addresses. On paper with printed heading of the British Antarctic Expedition 1907. Includes a card with facsimile signature of J. B. L. Noel, Mount Everest Expedition 1924. Polar explorer (1874-1922). 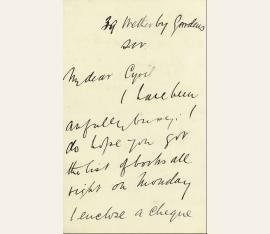 Autograph letter signed ("E. H. Shackleton"). London. 4to. 1 p.
To the lecture agent Gerald Christy, instructing him to direct lecture fees to Press & Press, solicitors, in Bristol, from 1 October forwards. - On paper with printed heading of "British Antarctic Expedition 1907" (a number of punctures from staples). Polar explorer (1874-1922). 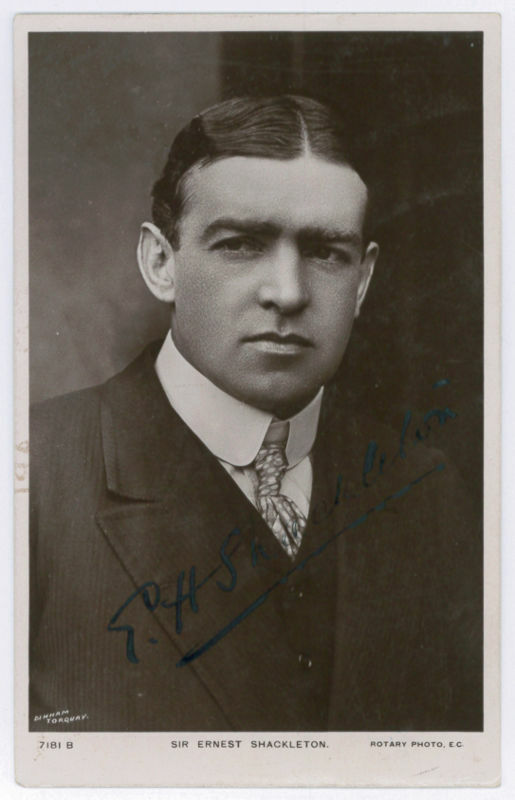 Portrait photograph signed ("E. H. Shackleton"). N. p. o. d. 8vo. With autograph address. The photograph, taken by Dinham, Torquay, depicts Scott in full face, and is addressed in autograph to Miss Barnardo in Dublin. - No postmark; slight flaking to ink of signature. Polar explorer (1874-1922). 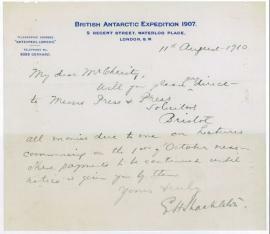 Autograph letter signed ("E. H. Shackleton"). No place. 8vo. Single leaf inscribed on one side. Matted and framed. To Lieutenant Willoughby, written aboard the H.M.S. Powerful, saying that he has noted the time and "all our people will be at Nimrod at 7:40 pm. The following are the names: Professor David, Captain England, Lieut. Adams, Dr. Marshall, Mr. Dunlop, Sir Philip Brocklehurst, Mr. Priestly, E. H. Shackleton [...]". - This letter was written during Shackleton's first Antarctic expedition on the small whaler, Nimrod. On the journey, the Shackleton team explored the Barrier, discovered the Beardmore glacier, reached the South Magnetic pole, and climbed Mt. Erebus, the world's southernmost volcano. Shackleton's book, The Heart of the Antarctic, describes the mission about to launched at the writing of the present epistle. 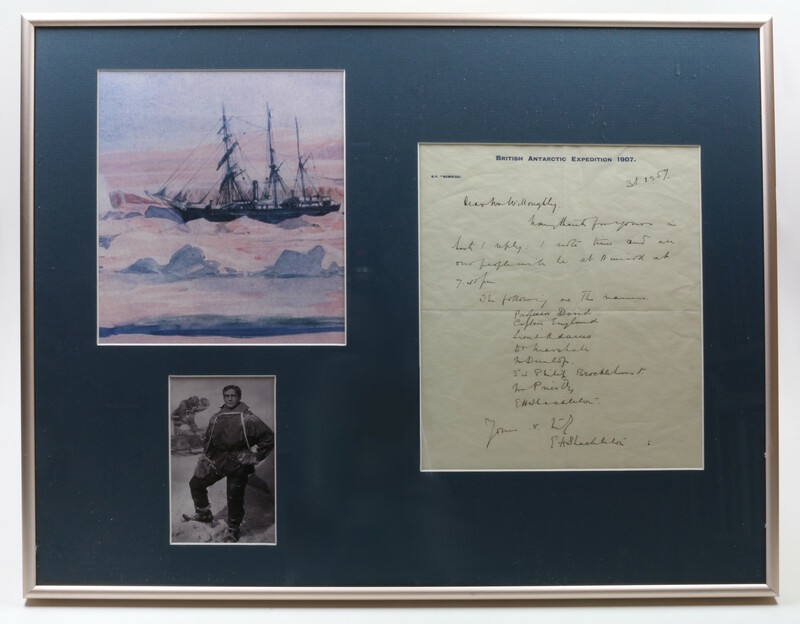 - On British Antarctic Expedition writing paper, with autograph addressed envelope..